Our meeting on 17 March 2015 gave us an interesting talk by Janet Tall about the sinking of the RMS Empress of Ireland following a collision on the St Lawrence River around 2am on 29 May 1914. The Canadian Pacific passenger liner in transit from Quebec City to Liverpool collided with a Norwegian collier named SS Storstad, causing the former to sink in 130 feet of water in around 14 minutes. There was a great loss of life totalling 1,012, including 134 children, making this the worst Canadian maritime accident in peacetime. By comparison RMS Titanic had sunk two years earlier with a loss of 1,503 lives. 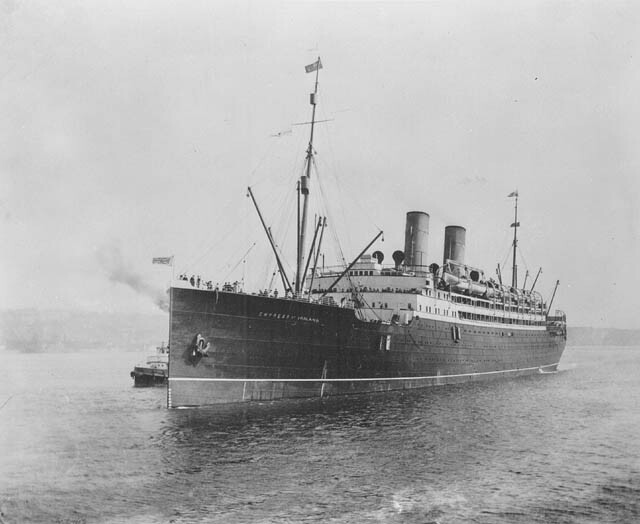 Independent enquiries in Canada and Norway reached different conclusions as to which ship was to blame, the Canadians finding for the liner while the Norwegians found against it. There were complex issues raised in regard to changing course in foggy conditions, and separately concerning the closing of watertight doors and portholes. Empress of Ireland had adequate lifeboats but not all of them could be launched due to the ship listing. This disaster led to an improvement in the design of ships’ bows, bringing on the raked bow. We learned that the sinking of RMS Empress of Ireland is not as well known as RMS Titanic because Archduke Franz Ferdinand of Austria was assassinated on 28 June 1914 and WW1 was set in motion. Lord Mersey’s Commission of Inquiry on the liner sinking began on 16 June 1914 and lasted for eleven days. 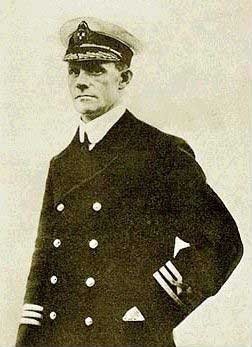 The captain of RMS Empress of Ireland was Captain Henry Kendall, well known in those times as the person instrumental in the arrest of Dr Hawley Crippen in 1910 after recognising the murderer as a passenger aboard RMS Montrose and setting in train his arrest. We are proud to announce that The Museum of Somerset is now an accredited museum. 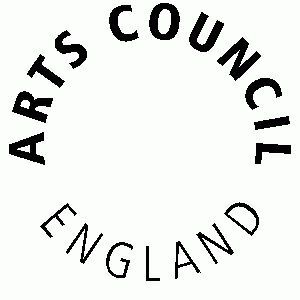 The Accreditation Scheme is administered by Arts Council England in partnership with others, and sets nationally agreed standards for museums in the UK. It is quality standard that serves as an authoritative benchmark for assessing performance, rewarding achievement and driving improvement. It raises awareness and understanding of museums, building confidence and credibility both within the governing body and among the public. 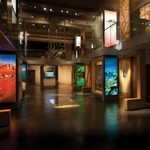 It helps museums to improve their focus on meeting users’ needs and interests and developing their workforce. It helps museums to examine their services and to encourage joint working within and between organisations. It helps with forward planning by formalising procedures and policies. It demonstrates that a museum has met a national standard, which strengthens applications for public and private funding and gives investors confidence in the organisation. Our February monthly meeting produced a talk by Janet Diamond entitled “The First Pyramid”. When Djoser, the first Pharaoh of the Third Dynasty, chose to build the royal necropolis at Saqqara, the nobility of Egypt had already been buried here for many generations. His monument, ‘The Step Pyramid’, at nearly 5000 years old, is the world’s first, most ancient, incredibly complex, vast and beautiful pyramid. Originally it was 62 metres (203 feet) tall. 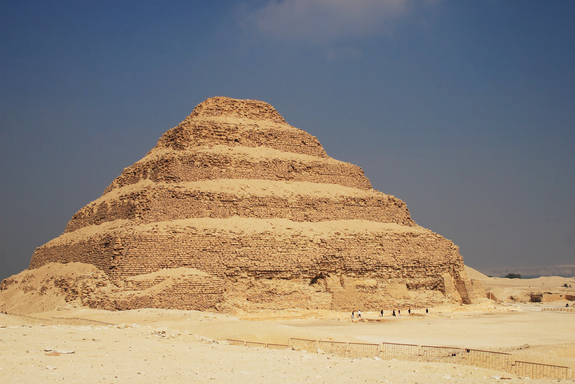 The Pyramid stands tall today and dominates the desert horizon and area of Saqqara. Yet it is only a part of the enormous funerary complex of Djoser. From what religious, cultural, artistic and political motivation did this pyramid spring? How and why was it conceived and built? These are the questions the speaker sought to answer and in doing so gave an insight into the development of royal burials of the Predynastic period and First, Second and Third Dynasties, and the political, religious, artistic and architectural influences that led up the building of the magnificent Step Pyramid at Saqqara marking the beginning of The Old Kingdom and the Age of the Pyramids. During this presentation one was struck by the enormous ego of the pharaohs and how much importance they attached to the afterlife, convinced that it would be a continuation, an enhancement, of their earthly existence. A typical tomb contained a dozen or so rooms into which were placed the earthly possessions that enhanced their status and lifestyle in this world and were clearly intended to do so in the next. All in all a fascinating presentation. 59 members attended the evening, which was a very enjoyable event. Many thanks for your continuing support. Members were treated on 20 January 2015 to a talk given by Janet Seaton and Barry Winetrobe. At the outset we were reminded that our country has ‘enjoyed’ fifty-three PMs, of whom the longest serving was Walpole from 1721 to 1742. For local interest, our attention was drawn to the Blue Plaque at 13 Canon Street, Taunton, which records D‘Israeli’s brief residence when he stood for the constituency in 1835. His prospects were considered poor and this was confirmed by a heavy defeat, despite reportedly wooing the voters with the claim that ‘there was no place like Taunton’. Janet and Barry went on to describe the role and function of a PM, reminding us that in the absence of a written constitution a definitive ‘job description’ doesn’t exist. A PM has a special and long established relationship with the reigning monarch, attending weekly audiences. The monarch may have reason to consider themselves the senior partner, since our present Queen has to date presided over twelve PMs. Citing however the example of the abdication of King Edward VIII, in a crisis it is the PM who holds sway. Baldwin made it clear that the King would have to go if he married ‘that woman’! Extra marital affairs are no strangers to PMs and several examples of this were cited. PMs can be undone by events, the whim of the electorate and even their own cabinet and party members. Most notably in recent history have been Geoffrey Howe’s resignation speech which hastened the fall of Margaret Thatcher, Churchill’s remarkable loss of office at the end of WW2 and Chamberlain’s demise at the beginning of that war. We were treated to numerous other interesting facts and figures. Our speakers held attention throughout and cleverly interspersed a couple of picture quizzes to provide a degree of audience participation. Following a vote of thanks by Chris Cooper, the generous round of applause summed up an entertaining evening. 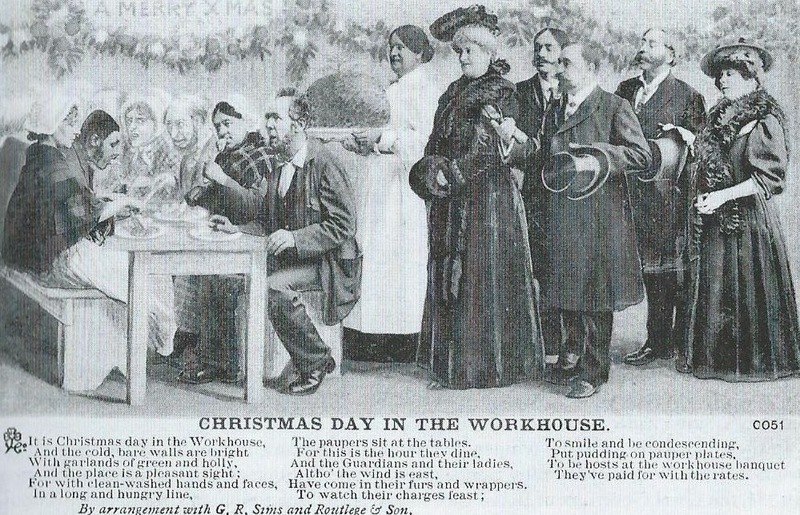 On 16 December 2014 we were treated to a talk by Sue Berry entitled “‘Tis the Season to be Merry’…… from Saturnalia to Christmas Day in the Workhouse”. How little has changed over the centuries: we all know how to celebrate! Saturnalia was an ancient Roman festival in honour of the deity Saturn, initially held on 17 December and later festivities were extended to 23 December. The salutation ‘lo Saturnalia’ was used as a seasonal greeting. Festivities included public banquets with a carnival atmosphere and the levelling of the social hierarchy, where masters provided table service for their slaves and purportedly slaves were permitted to disrespect their masters. It is not mentioned whether punishment was meted out following the celebrations!! 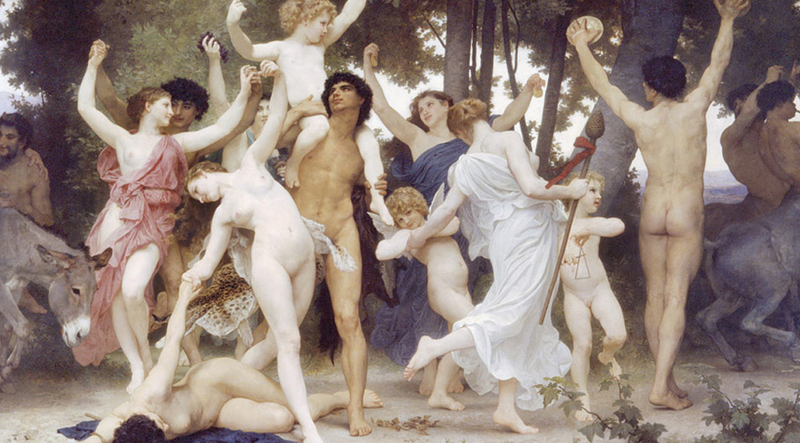 Rampant overeating, drunkenness and wild revelry became the rule: sobriety the exception! Is this not reminiscent of the twenty first century – the carnival atmosphere, the excesses, and drunkenness that we refer to as pubbing and clubbing! On Sigillaria, the last day of Saturnalia, gifts were exchanged to show either friendship or as a gratuity by the ‘boss’. Today we exchange gifts on Christmas Day. Over the centuries there were many changes made to the celebration, even including reportedly the trial of Father Christmas in 1686 for enticing drunkenness, gluttony and idleness! He was found innocent and acquitted. Those of you who still believe in Father Christmas must be breathing a sigh of relief! …to the other. Christmas Day in the Workhouse. In the Victorian times we saw local benefactors distributing gifts to their employees, or community. For some, these charitable acts kept the elderly and the unemployed out of the dreaded workhouse. However, although the workhouse was abolished in the first half of the twentieth century, we still see benefactors today (the general public) donating food to families who are living in poverty and reliant on food banks to celebrate Christmas. Is that not a touch of irony!! With help from the Friends, The Museum of Somerset has become the proud owner of a 10th Century statue of St Peter. This was originally found by a man who took it home and used it to mark the grave of his cat. Later it was spotted in his garden at Dowlish Wake, near Ilminster, and recognised as being an important piece of sculpture. Experts have identified it as a piece of national significance and the British Museum was interested in acquiring it. The statue was eventually purchased by a dealer and the gentleman then agreed to sell it to The Museum of Somerset. The Friends were able to initiate the purchase with a contribution of £500 and in turn this led to a successful application to three major charitable donors when the balance to £150,000 was raised. The sculpture was probably part of an architectural frieze around an important religious building. 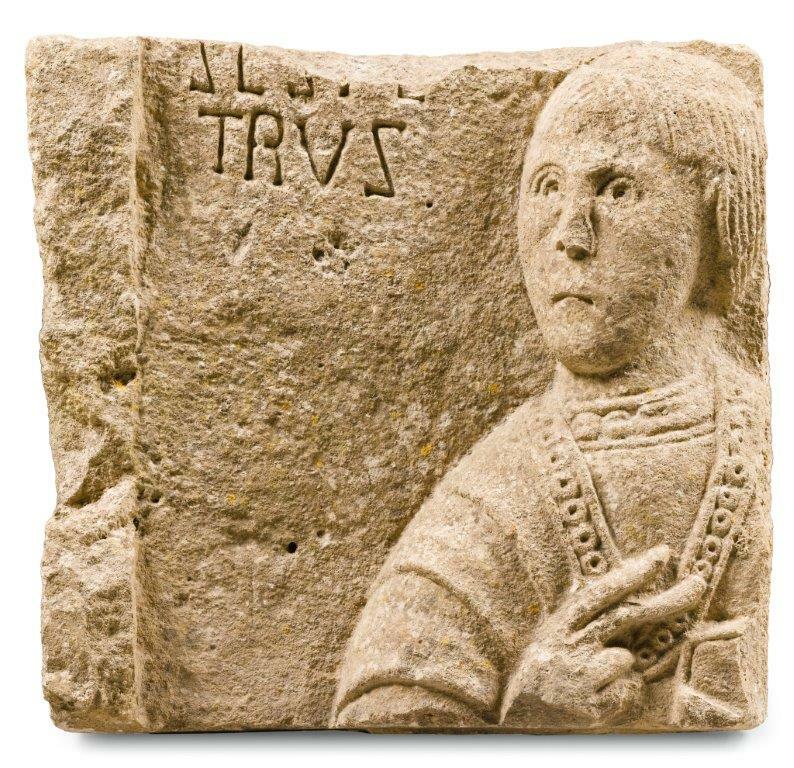 Identification of the figure is confirmed by the Latin inscription SC[S PE]TRUS, which represents SANCTUS PETRUS. It is carved from oolitic limestone, which occurs widely in the area of south Somerset. The statue is now on display in The Museum of Somerset, where it is an enormously important addition to the collection. Chris Cooper (Chairman), Brian Hunter (Vice-Chairman), Chris Jessop (Secretary), Mick Grigg (acting Treasurer), Maxine Courage, Wendy Flint, Marion Holley, Ann Pugh and David Watkins. A talk with slides by Steve Minnitt, Head of Museums, followed the AGM. This fascinating talk dealt with the story behind many of the Roman articles in the Museum. These included such details as the finding of the Dido and Aeneas mosaic at Low Ham, how it was uncovered, cleaned and finally rolled up and moved to become one of the Museum’s main attractions. 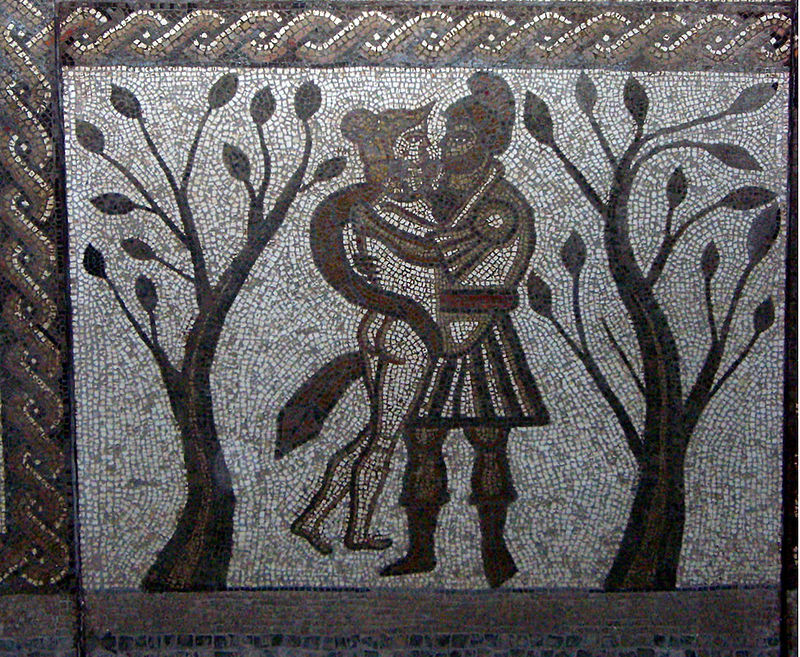 Then the story of Dido and Aeneas as shown on the mosaic itself from the arrival of Aeneas, his love for Dido and finally the departure as his ship sailed away. Similarly fascinating was the story of the finding of the Frome Hoard, now displayed in the Museum, from its discovery in a pot in a field near Frome, details of why it was likely to have been buried there, how it was removed, how the coins were cleaned and how the broken pot was repaired piece by piece before it arrived in the Museum. 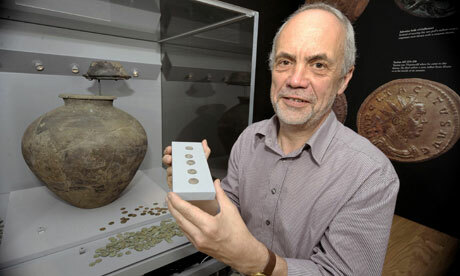 The collection of Roman coins is of particular interest to Steve. 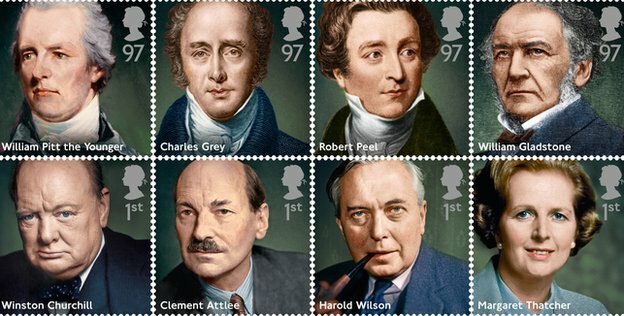 Apart from their obvious use as currency they were very important as a means of propaganda. This was demonstrated by coins of the Emperor Caurausius, a general who proclaimed himself Emperor of Britain in 286AD. The reverse of his coins show a peace loving emperor as he is welcomed by Britain, another of two hands joined showing his good relationship with the army. He was assassinated seven years later! Steve is one who is able to convey his considerable knowledge with clarity and enthusiasm. If you are interested in the Museum and missed his talk then you missed a treat. 50 members attended the meeting. Thank you for your continuing support.